FanXT Ltd. (http://www.fanxt.com), a global fantasy sport games provider is introducing Fantasy Premier League Commissioner (http://fantasy.epl.fanxt.com) coming to fantasy football market for season 2014/15 that allows anyone to run their own English Premier League (EPL) fantasy for FREE! 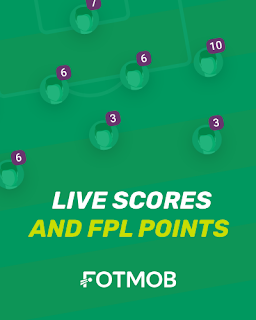 Most sports fans are going to be very happy with this fantasy football game, due to football fans will not longer be limited by all those regulations set by the creators anymore as of other typical fantasy EPL league currently available on the Internet. 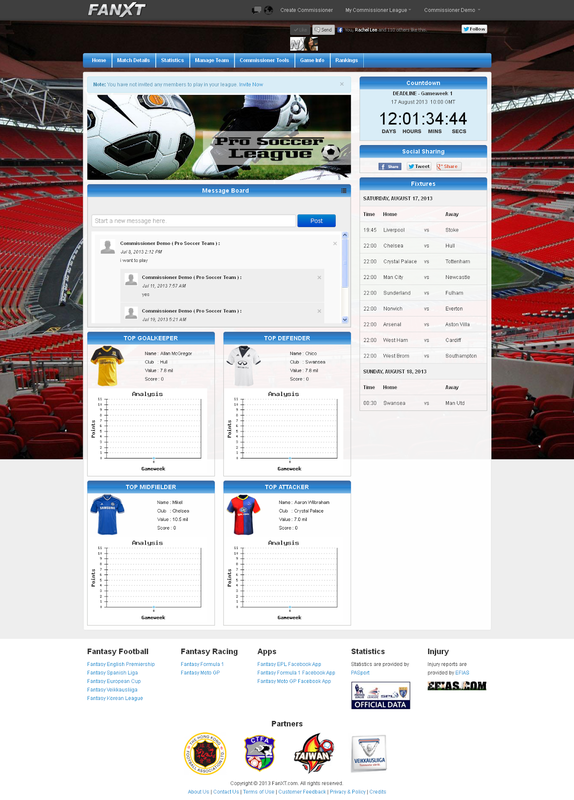 This game is a fantasy football league game that gives EPL fantasy enthusiasts a chance to not only have ultimate customization such as set their own scoring system, budget and players’ valuation, but also personalizing the system to their own taste such as as their own domain name, logo, background and colour theme. What’s more, the users can invite their friends via built-in friends invite feature and also get the important updates via message board. There’re still a lot of other functions such as notifications for changes within the league and the English Premier League, latest feeds of live score, results and etc. This fantasy football game is truly something out of the ordinary. It's like private league on steroids! Check out more amazing features in this game starting from now! Not all Barclays Premier League fantasy game is governed by stiff rules created by the game developer. FanXT is introducing a Fantasy Premier League game like no other called the Fantasy Premier League Commissioner. This game can be run on PC or website as what the users like with their own rules and own ways. 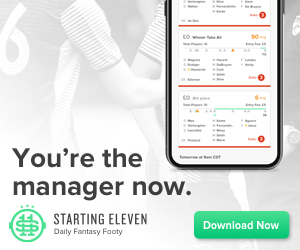 With FanXT Fantasy Premier League Commissioner where users could have much more freedom and controls upon the game, they can set the number of teams who join the fantasy league, form their fantasy team, customize players’ value and scoring points. They also can gear up with statistics of their favorite players. This game is like EPL Fantasy League on Steroids. Over 3,000 Fantasy Football Leagues Have Been Created. Lets create your own league for FREE in just 3 minutes! FanXT (www.fanxt.com) is an international award-winning digital sports media company that develops the Internet and mobile rights of sport leagues around the world. FanXT is a sister company to Just Mobile Sdn Bhd, a Malaysian MSC-status company. We are also the Official Fantasy Football Provider for Finland’s Veikkausliiga, Hong Kong First Division Football League, India’s I-League, Philippines’ United Football League, and Singapore S.League. Fantasy sport is considered a game of skill, at least in the U.S. What better way to earn cash than playing the game itself, but right from the comforts of your own home? If you are a true blue soccer fan who knows your players inside-out, this would be the best way to earn some immediate cash. Games like FanXT Fantasy World Cup 2014, http://fantasyworldcup.fanxt.com allows you to pit your analytical skills against other soccer fans, and win cash if you’re one of the top managers. Although it is true that online sports betting itself is not legal in most parts of the world; daily fantasy sports are far from sports betting, and has been outlined as legal in the Unlawful Internet Gambling Enforcement Act of 2006. Fantasy sports rely heavily on knowledge and skill, of which the cash prizes are predetermined and not influenced by the number of participants or the amount of fees; unlike sports betting which relies on chance. Here’s a Daily Fantasy Soccer for World Cup (http://worldsoccertalk.fanxt.com) by WorldSoccerTalk that you could try your skills on. So what’s stopping you from turning your skills into cash; all while watching the beautiful game? That says it all: you can design all sorts of designs and get your local printing shop to get the shirts done. 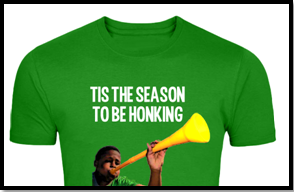 A surefire way to make your designs sell is to make them as witty as possible! If you want to go international, there’s always t-shirt sites like those outlined in this article (http://goo.gl/33B78C) that help in getting your designs to the market. As much as we love going out; sports bars are never nearly as comfortable as home sweet home (who wants to smell like cigarettes, beer and old sweaty men anyway?). Sitting alone with the TV on isn’t quite celebratory, either, is it? So throw a weekly world cup party! You will meet people just like you who like the comforts of home; but at the same time, you can make a bit of money by selling refreshments. It’s even better if you can come up with creative drink names for cocktails or mocktails and finger food – as you can be sure that you get repeat customers, and have a pool of followers. 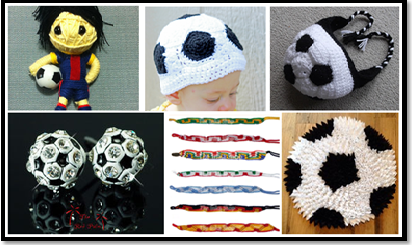 People always feel the need to express their passion for football, and you can cash in on this very basic human need to belong, by making and selling world-cup related paraphernalia. There are many tutorials online that you can follow to make crafty keychains, earrings, rugs, knitwear and more. These not only come in handy or accessorise, it hold a certain value, especially if exchanged as gifts. You can even maximise profit by using recyclable items. So it is no excuse to simply sit around with boredom burning a hole in your brains while waiting for the next world cup match, you can simply use up that time researching, planning and making cash! Rachel Lee is an independent digital media specialist. 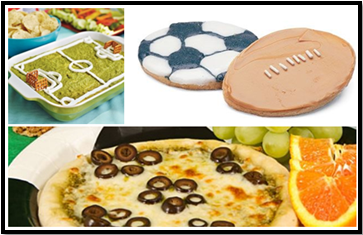 She loves sports especially football and motor racing, street foods, and hanging out at social gatherings.